Below are videos of the core exercises found on whyiexercise.com. The videos are organized by level of difficulty, with the easiest being first. Each video is about 1 minute long. Follow the onscreen tips to get the most from these exercises. *Note: There are many exercises on this site that work multiple areas of the body at once. As two examples, Forearm Plank and Front Support are for the core and the upper body. Many of the exercises above have varying levels of difficulty, so you can adjust them as desired to make them easier or more difficult. There are also several articles which group the exercises into 15 minute workouts. The articles include detailed illustrations and more specific instructions. See below for more information. This article combines the first 4 exercises above with 3 other strengthening exercises for a complete routine that helps you develop a strong, balanced midsection. 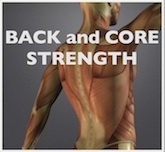 Strengthen the deep muscle layers that support the spine, including the back muscles and all 4 abdominal muscle groups. This article takes the back strengthening exercises to the next level. Develop even greater muscular control to enhance your posture and improve the tone and balance in your midsection. The final 3 exercises above (plus a more advanced version of 'The 100') are all part of this routine. 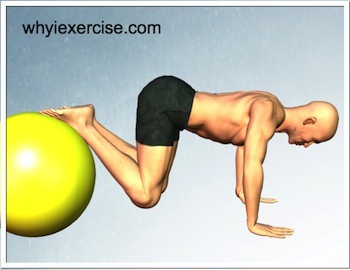 Front Support is part of a challenging core and upper body routine using a stability (swiss) ball. The routine is excellent for shoulder and spine stabilizing muscle groups.